While Half Dome is one of the most popular hikes in Yosemite National Park, it should not be taken for granted. This is a long day hike with a strenuous amount of elevation gain, followed by two exposed sections on bare granite at high elevation. This is not a good choice for casual tourists who are not in good hiking shape. 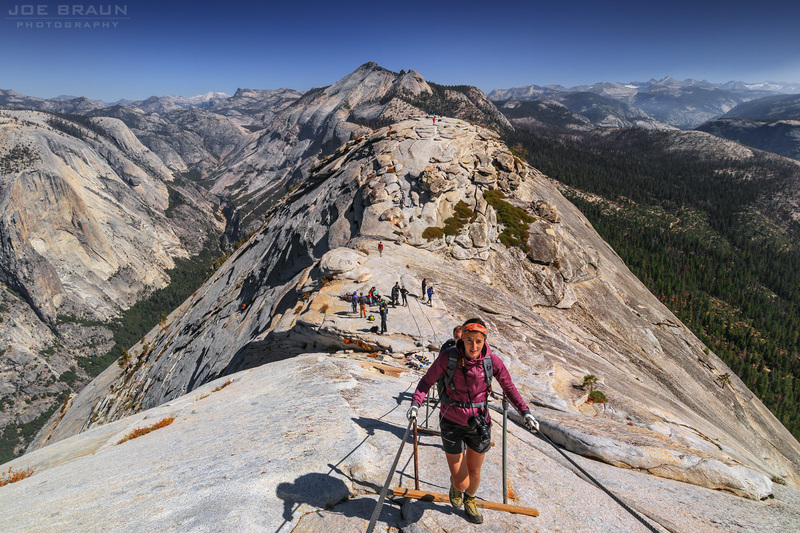 Seasons: Late spring to early fall (typically late May to mid October when the cables are up, dependent on weather) for the summit of Half Dome. Lower portions of the Mist Trail are open year-round. Permit Required? YES. Access above the Subdome is limited to 300 people a day when the cables are up. 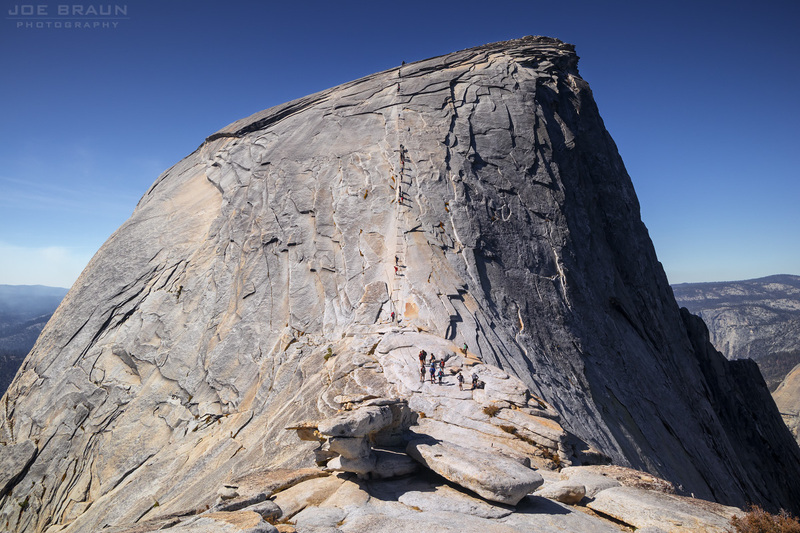 Due to the epic popularity of this hike, NPS has implemented a permit system, allowing only 300 people a day to the summit of Half Dome when the cables are up. Permits are available in a preseason lottery and a last-minute daily lottery. See the NPS Half Dome Permits page for more information. While your chances of securing a permit on any given day might be only 5-20%, know that when you do this hike you will not have to experience a chaotic gridlock-like crowd at the final cables section. Start as early as you can, even before dawn, to maximize the amount of time and daylight for you to summit Half Dome and make it back down safely. Bring a gallon of water with you, especially during the summer months. The upper sections of this hike are hot and dry. Also bring protection from the sun (hat, sunblock, etc.). While the lower portions of the Mist Trail are beautiful, don't waste your time on them; your goal today is to get to the summit of Half Dome! Come back another day to leisurely soak up the wonderful Mist Trail scenery around Vernal Fall and Nevada Fall. Remember to bring your permit, whether printed or in electronic form. It would be tragic to hike all the way up to the Subdome only to be denied by the ranger who guards the final section of this hike. If you use hiking poles, bring them! They are extremely helpful for the unrelenting ascent of the trail. You will only stash them for the final cables section. While the hike starts at 4000 feet, the summit of Half Dome is at 8839 feet. If you are not used to high elevations, you may be short of breath near the summit. Go easy and take frequent little breaks if necessary. Bring gloves for the cables; your hands will thank you. While not required, if you are terrified of the cables and want to bring extra protection, a climbing harness with slings and carabiners can be used to clip yourself into the cables as you make your way up or down. Know how to use your gear before your hike. Do not ascend Half Dome if there is a threat of a thunderstorm. Half Dome often gets struck by lightning and the last place you want to be during a storm is on a high exposed peak holding onto a giant metal cable. From the Happy Isles Trailhead, follow the paved trail south as it begins its ascent up the narrowing gorge that surrounds the Merced River. At .9 miles is the first hikers' bridge; on the far side is a water fountain and bathrooms. Continuing up the gorge now on the right (south) side, the trail gets more strenuous with many granite steps making their way up the steep slopes in front of Vernal Fall. During spring runoff, this part of the trail is thrilling as spray from the powerful fall makes everything wet and slippery; there is a reason they call it the Mist Trail! (While you will typically remain dry during the low-flow late summer and autumn months, be prepared to get wet during spring and early summer.) Just past the spray zone, the steps get even steeper as the ingenious trail heads into an alcove before making its final ascent to the top of Vernal Fall. Above Vernal Fall, the trail continues along the banks of the river as the majestic Liberty Cap and Mount Broderick peaks can now be seen in the distance. A second hiker's bridge crosses back over to the left (north) side of the river as the trail wanders up through a lovely forested section. Then with Nevada Fall in view, the trail makes its final big push up several switchbacks that ascend the boulderfield under Liberty Cap. Just as you think your legs can't do it any more, the trail will top out. 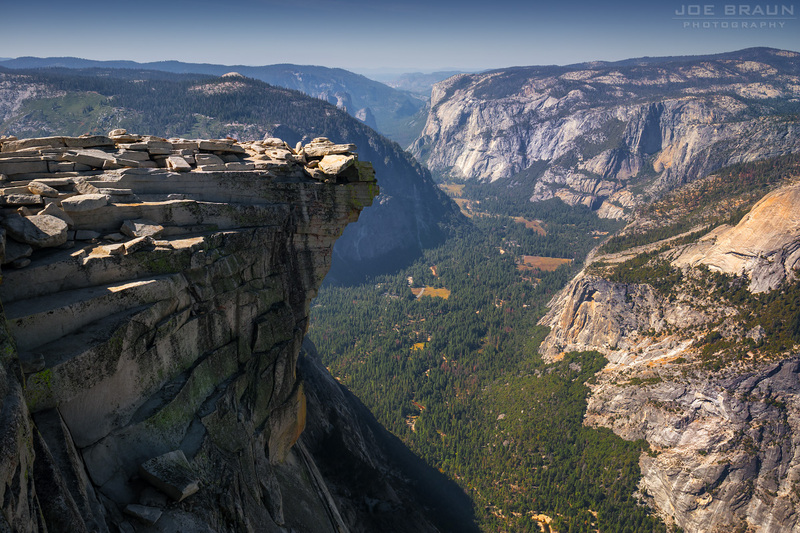 You are now roughly 2000 feet above the floor of Yosemite Valley, but you still have 2800 feet more of elevation gain to get to the top of Half Dome! After roughly a mile in Little Yosemite Valley, it's time to work hard again as the trail heads north and zigzags its way up the forested slopes, ascending roughly 1600 feet in two miles to reach the top of the ridgeline. (Along the way, you will pass one last junction with the trail that continues up to Clouds Rest.) This section may seem unrelenting, but keep a slow and steady pace and allow for plenty of short breaks if you are out of breath from the elevation. Once you are heading east on the ridgeline, the forest will thin out a bit and you will see great teaser views down into Tenaya Canyon to the right (north). Soon enough, you will see your final destination straight ahead: Half Dome with the round "Subdome" in front of it. The Subdome is the rounded shoulder formation of bare granite to the east of Half Dome proper, and as you approach it, it will look intimidating and improbable, but once you're on it, it will seem quite reasonable. (A ranger is usually stationed at the base to check permits.) The ingenious trail is akin to a giant staircase, zigzagging its way up the cracks and features of the steep and exposed formation. 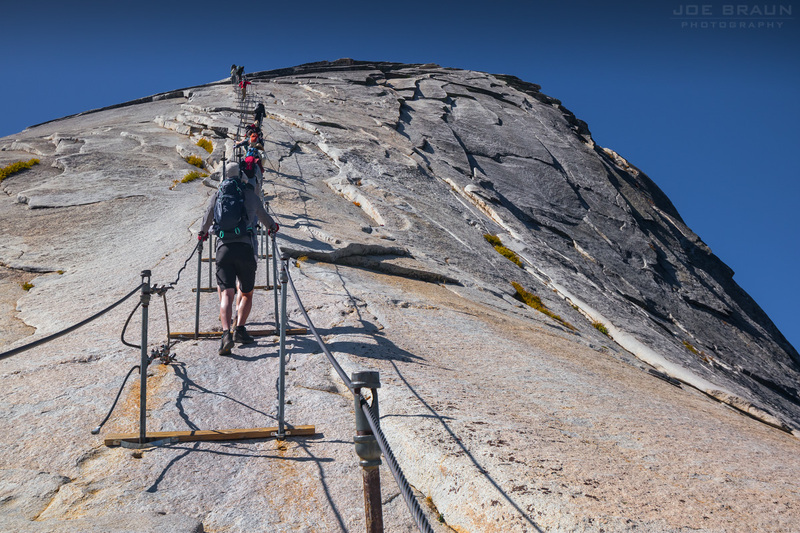 This section is strenuous but it relents soon enough and then you will be facing the final obstacle: the cable route up the bare east ridge of Half Dome! Stow your hiking poles and put on your gloves for the most thrilling and terrifying section of trail in Yosemite. The cable route is basically two parallel steel cables held up by vertical poles that function as handrails. Wooden blanks at the base of each set of poles provide footing and rest areas for people going up and down. As you make your way up the cables, you will use quite a bit of arm strength to pull yourself up as you move your feet to the safety of the next wooden plank. Because the granite has been polished from so many years of hikers, it can be slippery. Follow the lead of the hikers in front of you and move to the right side to allow people descending to pass. As you make your way up, the angle does get steeper and more intimidating, but eventually it relents and you will be standing on the summit! Once on the summit of Half Dome, be sure to walk north to the actual high point to see the views from "the visor" (a spot where pieces of granite curl over like a breaking wave) down into Yosemite Valley, north to beautiful Tenaya Canyon, and you can also hike southwest to the second highpoint to get views south to Little Yosemite Valley and southwest to Glacier Point. After you have had your fill, it's time to descend the cables which for many people can be more intimidating than the ascent. While most people head straight down holding both cables, some find it better to go sideways holding just the right cable. Do what works for you and be patient as there is often somebody going very slow having a panic attack. Once off the cables, it's time to celebrate your survival and retrace your steps back down to Yosemite Valley! While the hike back down is quicker and less strenuous, it's also harder on the knees, especially with tired legs. 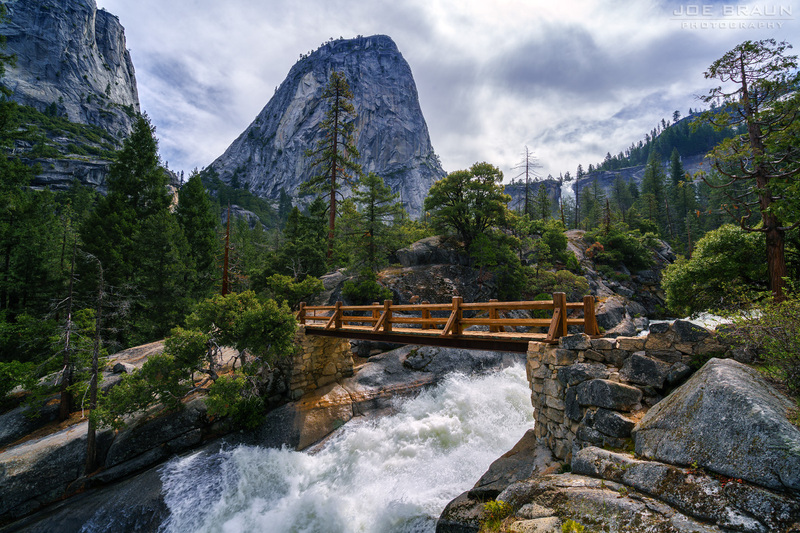 And when you're back near Nevada Fall, you have the choice between taking the Mist Trail or the John Muir Trail. 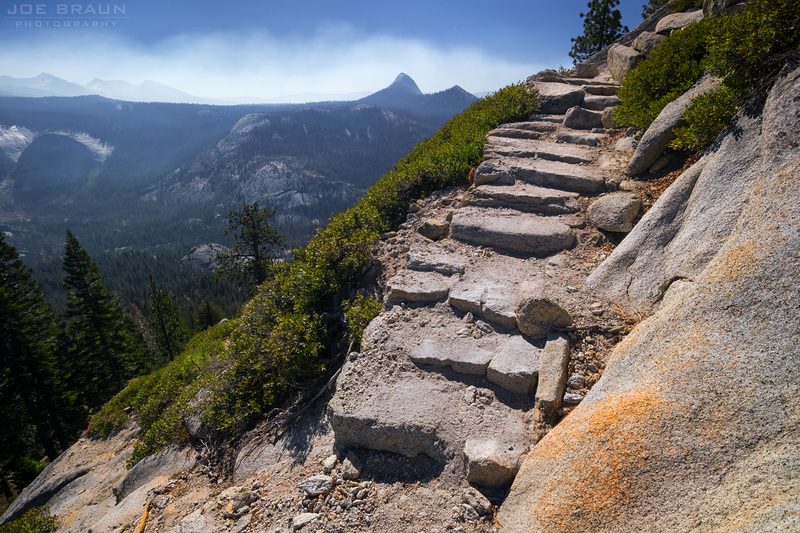 While the John Muir Trail is slightly longer, it gives you great views above Nevada Fall, it's the drier route, and its more gradual descent may make your knees happier. Back at the Happy Isles Trailhead, it's time to celebrate the fact that you survived on of Yosemite's most awesome hikes!!! Wow. Yes, this is a classic Yosemite hike. It's overly popular and it makes every "Top 10 Hikes That Will Make You Feel Like a Badass" list, but it really lives up to its hype. It's a hike that really sticks in your memory as a great experience, especially now that the permit system has gotten the crowds under control.